The Angriest: Jessica Jones: "AKA 99 Friends"
While continuing her hunt for Killgrave (David Tennant, Jessica (Krysten Ritter) accepts a case from a jewelry designer who suspects her husband is having an affair. Meanwhile police officer Will Simpson (Wil Traval) returns to Trish's apartment to apologise for his actions while controlled by Killgrave. At the law firm, Hogarth (Carrie Ann Moss) and Jessica begin putting together a support group for Killgrave's victims. While failing to match the quality of the series' first two episodes, "AKA 99 Friends" at least manages to improve on the third. Many of the problems that disrupted that episode for me are still there, but for whatever reason they are being managed a little better. The overall story arc progresses to a satisfying extent while time is taken out for an essentially self-contained storyline at the same time. To get my biggest complaint out of the way: once again the series starts referencing events depicted in the broader Marvel Cinematic Universe: the adultery case that Jessica accepts is actually a trap intended to ambush her for being a super-human. The wife that hired her is actually mourning the death of her mother during the Chitauri invasion of New York (see The Avengers), and blames all super-powered people for what happened. It was admittedly a surprise, just not one I particularly liked. 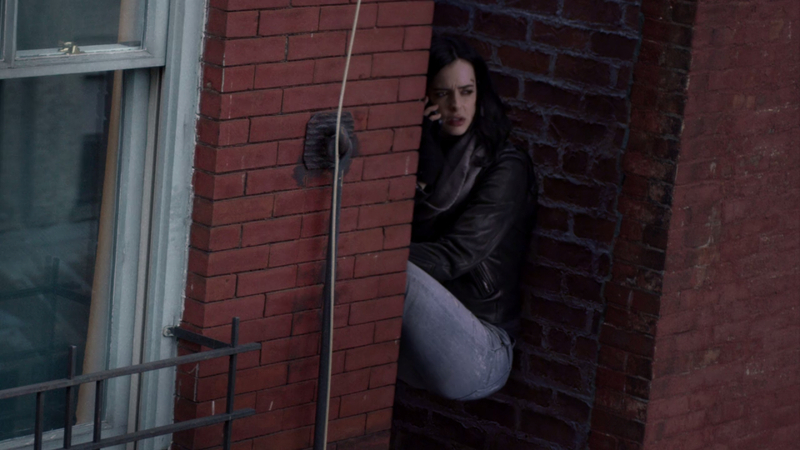 I still believe the presence of the MCU generally works to Jessica Jones' detriment, but at least in this episode something is actually made of that backstory in a fairly unexpected way. What actively irritates is the roundabout manner in which these background elements are referred. Captain America is referred to only as "the flag waver", and the Hulk as "the big green guy", and the large-scale alien invasion of New York as "the incident". It's a weirdly obtuse approach whose only real effect is making it seem like the producers of Jessica Jones are actively embarrassed by their MCU links, in the same way that people refer to Uncle Johnny's "special problem" at family gatherings. While I would personally prefer Jessica Jones avoid any links with the MCU, they need to either do that or fully embrace it. This awkward middle ground is just annoying to watch. The second encounter between Simpson and Trish is well played and pushes Simpson's character in a surprising direction. I had honestly expected the character to be gone and done in the one episode, and bringing him back has opened up a whole new direction for Trish. It is a nicely complex set of scenes, combining fear, trust issues, and a growing affection underneath. I'm interested to see where it goes. Hogarth also gets the benefit of some strong scenes this episode, as she gradually becomes less and less sympathetic. She is still reluctant to assist Jessica in tracking down Killgrave, and her messy divorce and rushed new love affair and colliding into an emotional trainwreck. It is a wonderful storyline for the series, because it just adds more women into the mix. This series definitely has one of the best representations of female characters I can recall in recent years - arguably any years. In one final plot thread Jessica finally identifies the mystery photographer who has been stalking her on Killgrave's behalf: her drug-addicted neighbour Malcolm (Eka Darville). It's not a surprise (why else is he in the series so prominently) but it gives the ending a nice emotional punch. Four episodes into the season and three have been good. The first two in particular were great. The quality ratio rises to 75 per cent.